I’m loving the layered look for children and see no reason why little girls can’t wear their gorgeous sun frocks all year round. As the weather changes from bright, sunny days to cooler, darker days it’s fun to still wear bright colours! Handmade right here in Australia, the funky and fabulous Frankie Rose dresses have me feeling bright and cheery at the idea of bursts of colour on a dreary day. I love the look of the lime green Dotty Dress (pictured above right) teamed with black jeans and a long sleeve top. The Smock Dress (above left) is undeniably cute with its tie waist detail, it screams to be teamed with leggings. 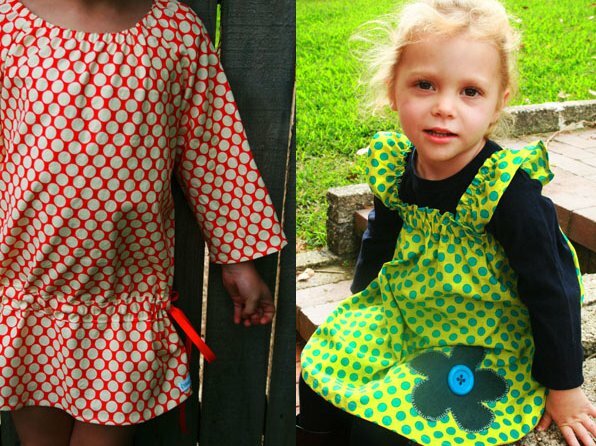 The dresses at Frankie Rose are made from beautiful quality, designer cotton. Sizes are from zero through to five, with custom sizes available on request. The dotty dresses also feature a gorgeous large flower appliqué, which is sure to bring a squeal of delight from its wearer! Prices start at $34 for the Dotty Dress. To get yours, head over to Frankie Rose. Delivery is available all over Australia.